And I’m back. I meant to blog more over the summer… journal my Fringe tour, for instance… but as I’ve mentioned in the past, it can be hard to keep on a blog when other writing projects are sucking up your creative energies. Or when the unfamiliar heat and humidity of Ontario in the middle of summer and other personal issues are making it hard to have creative energy. But the first draft of my second pantomime is done, and I’ve traded humidity for record-setting rainfall, so I am back. 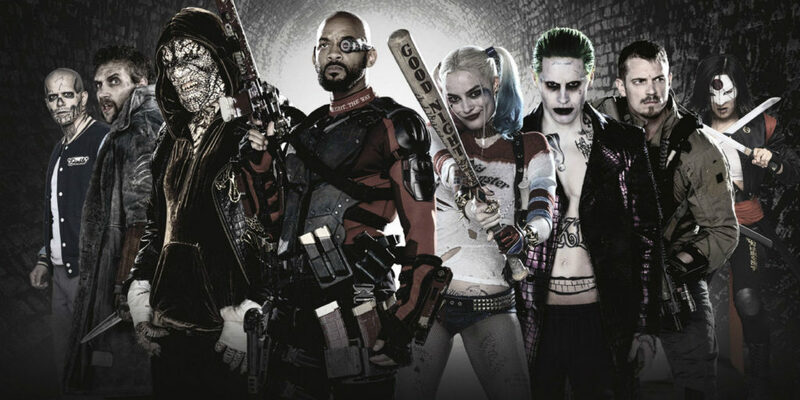 So let’s talk about Suicide Squad. So first of all, no. None of that. People claiming this are either lying for traffic or just wrong. I’m not saying they’re wrong because they’re stupid, since I don’t know any of them personally, but we can’t rule it out. That’s not to say it’s perfect, or the best superhero movie of the year, or anything approaching that. It’s not without jokes and one-liners, but the laughs that exist fall short of Deadpool or the airport fight from Civil War, which remains the best and most fun sequence from any blockbuster film I’ve seen this year, comic book or otherwise. It’s good for what it is, which is a simple, flashy in places men-on-a-mission movie with a comic book coating. And for that, it works pretty well. Honestly I don’t get what the naysayers are complaining about in most cases. In most cases. In one case I do. 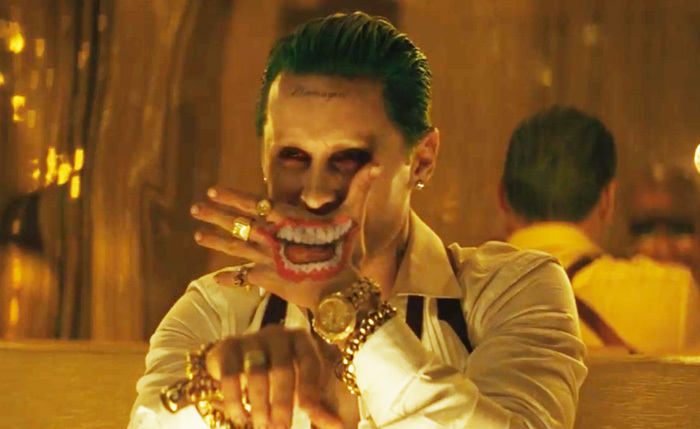 Jared Leto’s Joker has dominated the conversation around this movie, so let’s get him out of the way. …but the real issue is that he mostly just snarls and giggles and mopes about having lost Harley. Joker caring about a person, even Harley, is un-Jokerish enough but there’s a deeper problem here. I’m not saying that Joker should be funny. That’s not the point. The point is that Joker’s best crimes/stories revolve around a joke that only he sees, a joke of humanity’s futility. He does horrible things and he thinks they’re funny, and that’s not the Joker we’ve been shown here. This is just a moody pyscho who kills people for eyeballing his woman. Which is the worst scene of the movie, by the by, but fortunately it’s early, and then everyone can move on. There was a time when having a great villain was key to a comic book movie. As important as the hero, if not more so. Doctor Octopus and Spider-man 2, Joker and Dark Knight, and while it had highs and lows, Magneto sold the X-Men franchise. But the importance of the villain has not been the case as of late. Okay, scream “DC bias” all you like, but I’m pointing a finger at Marvel. Though not necessarily in a bad way. While the Burton/Schumacher Batman movies put more effort into their villains than Batman himself (to mixed results), Marvel has managed great success while shifting the focus to the heroes. In short, Marvel villains tend towards bland and formulaic, and they make scads of money anyway, because if the Guardians of the Galaxy are fun enough to watch audiences will apparently forgive Ronan the Accuser being two-dimensional. Hey, it’s not just me saying this. People have been talking about Marvel’s villain problem for years now. But this is really just a long lead-up to saying that, like a Marvel movie, Suicide Squad is not putting a ton of effort into their primary villains. In short… and here’s the spoiler… Amanda Waller has successfully controlled a millennia-old witch called the Enchantress, who was awoken when an archaeologist named June Mune (Cara Delevingne, more effective as the evil witch than the archaeologist) wanders into the wrong cave and gets possessed. See, Enchantress and her un-awoken brother Incubus used to rule the world and be worshiped as gods back before they got stuck in statues. Now Enchantress finds herself in the modern world, enslaved by Amanda Waller. She doesn’t care for any of it. But while she can’t fully break Waller’s control, she can wake up her brother so that he can shield her from Waller’s retribution, allowing them to re-conquer the world. So that’s what she sets out to do. Short version, Enchantress escapes Waller, teams up with Incubus, and begins a ritual to rule the world. And there we leave her until the climax. Sure, we check in once or twice, but that’s basically all she does. …but she doesn’t exactly blow the doors off the place. I think this might have more to do with writer/director David Ayers’ style. Look at Fury, his movie closest to Suicide Squad. He doesn’t spend a lot of time on the villains because we as an audience don’t need a lot of reasons to understand that the Nazis, and the SS in particular, were worth fighting. So he spent his time on the men in the tank. So, too, does Suicide Squad spend more time with the Squad than with Enchantress and Incubus. They’re doing something bad, it needs to be stopped, that’s as much detail as they feel we require. Because getting this particular group of people to work together against a common foe… a common foe that isn’t their “employers…” isn’t an easy task. Let’s run through them, shall we? Harley Quinn/Margot Robbie: One of the two biggest highlights of the film’s cast. After a rocky start weighed down by extra crazy and some weird shooting choices Ayers makes during Joker scenes, Margot Robbie is incredible as Harley Quinn. Everything you’d want from the character. Well… except one thing. They could’ve given her pants. Wouldn’t have hurt anything to give her pants. I’m just saying. Amanda Waller/Viola Davis: Also awesome. She’s tough, she’s ruthless, she can stare down five deadly killers and come out on top. Is she one of the villains of the movie? That’s debatable. She walks the line very well. Why doesn’t she have a cameo in Justice League, exactly? Captain Boomerang/Jai Courtney: Here’s a sentence that is almost never uttered: Jai Courtney crushes it. Captain Boomerang is selfish, manipulative, and consistently fun to watch. This movie nails the character in a way his appearance on Arrow just didn’t, and Courtney, normally known as one of those bland white action leads that you forget about when the movie’s over, kills it. Rick Flagg/Joel Kinnaman: Another actor I didn’t expect much from, having (and I had to look this up) not exactly set the world on fire as reboot Robocop. As the Squad leader, he does well crossing from tough and resentful to be working with psychopaths to vulnerability when he needs to ask those psychopaths for help stopping a disaster… which will likely involve killing the only woman he’s ever loved. El Diablo/Jay Hernandez: The heart of the Squad. Probably has the deepest backstory of anyone. Some people call him a stereotype, and the way he’s talked to can be a little on the racist side, though I would counter “Supervillains, abusive/corrupt prison guards, and black ops soldiers aren’t known for their racial sensitivity,” but maybe this isn’t a good argument for a white dude to pick. But according to some, it could have been worse. Killer Croc/Adewale Akinnuoye-Agbaje: For the second time in a comic book movie, Adewale gets buried under so much makeup that there’s only so much he can do. He had the occasional decent line but was mostly there to be big and menacing. Katana/Karen Fukuhara: Somehow given less to do than Killer Croc. She’s pretty much just there to look badass in a samurai fashion and kill things with a sword. I appreciate you trying to add another woman and some more POC to the Squad, but you don’t get points for someone two-dimensional and fairly stereotypical. Better on Arrow. Slipknot/Adam Beach: I mean what the hell. I get that you needed to kill someone to prove that the neck bombs weren’t a bluff but did it have to be someone you just introduced? And one of the POC characters? Seriously, right as the Squad (most of whom got their own splashy intro flashbacks) gets ready to leave, a car pulls up and they’re all “Oh right, and here’s Slipknot.” Then he’s dead in under five minutes Come on, man. Here are some points that seem too short for entire entries. I was really impressed with the visuals, especially in 3D. Some of the Enchantress effects seemed super cool to me. Cool to have cameos from Ben Affleck and Ezra Miller. Now that I’m seeing the movie Flash suit in action, it’s growing on me. I don’t see how people are complaining about the plot not making sense. Okay, sure, we don’t know right away why the Squad are dispatched to Midway City, since they aren’t being sent after the villains until the climax, but they don’t know either, so why should we? And once you get past that, it makes perfect sense. If you pay attention, anyway. Ultimately I enjoyed it. I got swept up in more than one moment. It’s not a masterpiece and doesn’t redefine the genre, but it’s enjoyable if you can get on its level. Except for some of the Joker stuff. Damn but I wish that weren’t true.